For liability, brand reputation, and customer retention purposes, it is critical to be sure that the fuel you buy and/or sell meets ASTM specifications. We will test your fuel against the required specifications, and, when possible, bring an off-spec fuel back into ASTM compliance. While we can improve characteristics such as water content and stability, if your fuel is beyond the allowable sulfur content, or contains too high a percentage of biodiesel, we will inform you and likely advise you to talk to your supplier. It is important to note here that ASTM specifications are simply minimum performance standards established to ensure that a product can be safely used for its intended purpose. Your fuel can and should perform better than the bare minimum standards. With our guidance and proven fuel quality solutions, it will. Unfortunately, fuel is not delivered from the refinery to the consumer in an air-tight drum. It typically travels by pipeline, ship, and truck, coming into contact with several common contaminants — including other distillate fuels — on its way down the supply chain. Water, the most common and most harmful contaminant to distillate fuel, can enter the fuel during refining, storage, transportation and/or delivery, and is virtually impossible to eliminate completely. Common scenarios include rainwater seeping in through the roof or vent of a tank, or humid air carrying moisture in during a fuel withdrawal. Once in the tank, water promotes the proliferation of microbial life — bacterial cells or fungal spores known in the industry as “bugs” — which will live in the water at the bottom of the tank and feed off the hydrocarbons at the fuel/water interface. Bugs will also consume rubber gaskets, O-rings, hoses, tank linings and coatings in an effort to obtain their mineral content. The waste from this process produces more water, sludge, acids and other harmful byproducts. If not addressed, the proliferation of bugs will clog fuel filters, fuel lines and gauges; corrode pumps, injectors and tank bottoms; cause washers, hoses and connectors to swell and blister; degrade fuel, and cause poor fuel economy. To prevent this, fuel storage facilities should be sampling and analyzing their fuel three to four times a year—especially during seasonal changes, when there are frequent swings in temperatures. As frigid winter air gives way to cool spring nights and warmer days, for instance, the alternating temps will conspire to create condensation within the tank, a leading cause of water contamination. AFS will sample your fuel in storage and give a detailed report of any found contaminants, offer to eliminate them, and empower you to prevent them from occurring again. A recent EPA study found increased levels of corrosion on metal parts in underground storage tanks containing ULSD. A NORA-funded study of 150 fuel samples pulled from storage tanks containing ultra-low sulfur heating oil found that moisture and microbial contamination should be a foremost concern for oilheat dealers and their customers. Because sulfur acts as a natural lubricant, ULSD/ULSHO is “dryer” than traditional diesel, meaning that its lower in lubricity, more prone to holding entrained water, and more susceptible to water and microbial contamination—the precursors to corrosion. The refining process used to remove sulfur also removes oxygen, nitrogen, and other functional elements, yielding a fuel that is more paraffinic, or waxy, to the detriment of its cold flow operability, and less stable in storage. 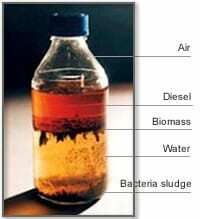 ULSD is also more solvent, or liable to loosen filter-plugging deposits in tanks. Lastly, just because ULSD is “cleaner” than traditional diesel, it is not any less corrosive to tanks, pipes, and system components. Periodic testing is highly recommended to identify potential problems associated with today’s ultra-low sulfur fuels, and to stop them before they negatively impact you or your customers.